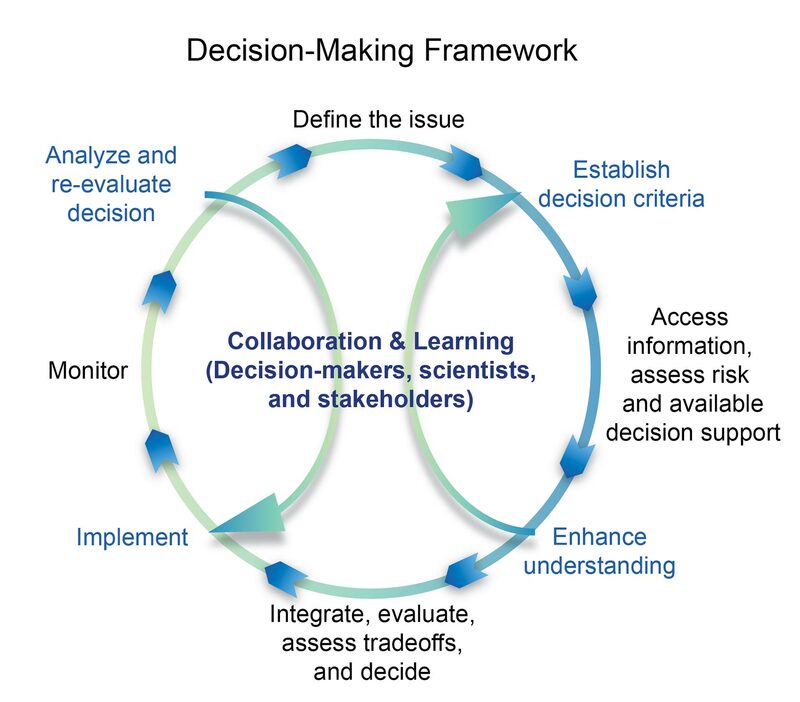 Decision support processes need to take account of the values and goals of stakeholders, evolving scientific information, and perceptions of risk. Available tools can enable decision-makers to identify and assess response options and clarify tradeoffs. This chapter introduces decision-making frameworks that are useful for considering choices about climate change responses through the complementary strategies of adaptation and mitigation. It also includes numerous examples in which decision support tools are being employed in making adaptation and mitigation decisions. It focuses on the processes that promote sustained interaction between decision-makers and the scientific/technical community. This chapter reviews the state of knowledge and practice in the context of managing risk. Extensive literature makes clear that in many cases, decisions aided by the types of approaches described here prove more successful than unaided decisions.2,189 Because of space limitations, the chapter describes some general classes of tools but does not assess specific decision support tools. Process for Developing Key Messages: During March-June 2012, the author team engaged in multiple technical discussions via teleconference (6 telecons) and email and in a day-long in-person meeting (April 27, 2012, in Washington, D.C.). Authors reviewed over 50 technical inputs provided by the public and a wide variety of technical and scholarly literature related to decision support, including reports from the National Research Council that provided recent syntheses of the field (America’s Climate Choices series, especially the reports Informing an Effective Response to Climate Change4 and Informing Decisions in a Changing Climate2). During the in-person meeting, authors reflected on the body of work informing the chapter and drafted a number of candidate critical messages that could be derived from the literature. Following the meeting, authors ranked these messages and engaged in expert deliberation via teleconference and email discussions in order to agree on a small number of key messages for the chapter. The sensitivity of the climate system to human activities, the extent to which mitigation policies are implemented, and the effects of other demographic, social, ecological, and economic changes on vulnerability also contribute to uncertainty in decision-making. Many decision support tools have been developed to support adaptive management in specific sectors or for specific issues. 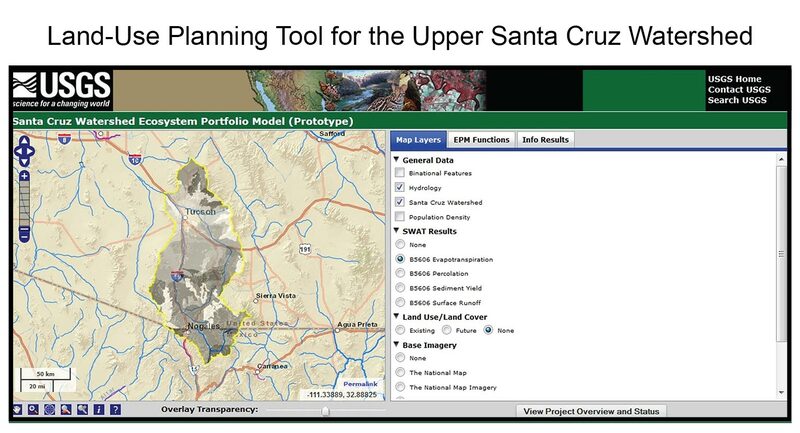 These tools include: risk assessments; geographic information system (GIS)-based analysis products; targeted projections for high-consequence events such as fires, floods, or droughts; vulnerability assessments; integrated assessment models; decision calendars; scenarios and scenario planning; and others.2,4,8 Many of these tools have been validated scientifically and evaluated from the perspective of users. They are described in the sector and regional chapters of this assessment. In addition, a variety of clearing houses and data management systems provide access to decision support information and tools (for example, CAKE 2012; NatureServe 20129,10). There are many tools, some of which we discuss in the chapter, that are currently being used to make decisions that include a consideration of climate change and variability, or the impacts or vulnerabilities that would result from such changes. Also important is the creation of a well-structured and transparent decision process that involves affected parties in problem framing, establishing decision criteria, fact finding, deliberation, and reaching conclusions.7,4,5 These aspects of decision-making are often overlooked by those who focus more on scientific inputs and tools, but given the high stakes and remaining uncertainties, they are crucial for effective decision-making on adaptation and mitigation. As part of a sustained assessment, it is critical to understand the state of decision support, including what is done well and where we need to improve. At this point in time, there is a lack of literature that provides a robust evidence base to allow us to conduct this type of national, sector-scale assessment. Developing an evidence base would allow for a movement from case studies to larger-scale assessment across decision support and would allow us to better understand how to better utilize what decision support is available and understand what needs to be improved to support adaptation and mitigation decisions in different sectors and regions. After a long period of relative stability in the climate system, climate conditions are changing and are projected to continue to change (Ch. 2: Our Changing Climate). As a result, historically successful strategies for managing climate-sensitive resources and infrastructure will become less effective over time. Although decision-makers routinely make complex decisions under uncertain conditions, decision-making in the context of climate change can be especially challenging due to a number of factors. These include the rapid pace of changes in some physical and human systems, long time lags between human activities and response of the climate system, the high economic and political stakes, the number and diversity of potentially affected stakeholders, the need to incorporate uncertain scientific information of varying confidence levels, and the values of stakeholders and decision-makers.7,1,2 The social, economic, psychological, and political dimensions of these decisions underscore the need for ways to improve communication of scientific information and uncertainties and to help decision-makers assess risks and opportunities. What are the decisions and who are the decision-makers? The Federal Government is engaged in decisions that affect climate policy at the national and international level; makes regulatory decisions (for example, setting efficiency standards for vehicles); and makes decisions about infrastructure and technologies that may reduce risks associated with climate change for its own facilities and activities. State, tribal, and local governments are involved in setting policy about both emissions and adaptation activities in a variety of applications, including land use, renewable portfolio and energy efficiency standards, and investments in infrastructure and technologies that increase resilience to extreme weather events. Private-sector companies have initiated strategies to respond both to the risks to their investments and the business opportunities associated with preparing for a changing climate. Non-governmental organizations have been active in supporting decisions that integrate both adaptation and mitigation considerations, often in the context of promoting sustainability within economic sectors, communities, and ecosystems. International Institutions A farmer decides whether to adopt no-till agricultural practices. A private firm decides whether to invest in solar or wind energy. A city develops a plan to increase resiliency to coastal floods in light of projections for sea level rise. A government agency plans incentives for renewable energy to meet greenhouse gas reduction goals. A national government develops its positions for international climate negotiations, including what commitments the government should make with respect to reducing greenhouse gas emissions. A United Nations agency designs a long-term strategy to manage increased flows of refugees who are migrating in part due to desertification related to climate change. Decision support refers to “organized efforts to produce, disseminate, and facilitate the use of data and information” to improve decision-making.2 It includes processes, decision support tools, and services. Some examples include methods for assessing tradeoffs among options, scenarios of the future used for exploring the impacts of alternative decisions, vulnerability and impacts assessments, maps of projected climate impacts, and tools that help users locate, organize, and display data in new ways. 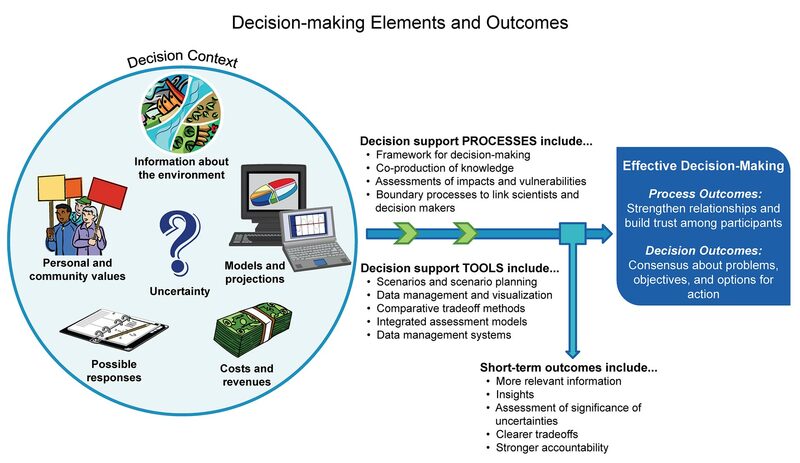 Outcomes of effective decision support processes include building relationships and trust that can support longer-term problem-solving capacity between knowledge producers and users; providing information that users regard as credible, useful, and actionable; and enhancing the quality of decisions.2 Decision support activities that facilitate well-structured decision processes can result in consensus about defining the problems to be addressed, objectives and options for consideration, criteria for evaluation, potential opportunities and consequences, and tradeoffs (Figure 26.1). Some analysts have emphasized the importance of boundary processes that are collaborative and iterative.13,14 In one example, federal, state, and local agencies, water users, and other stakeholders are using a collaborative process to manage the Platte River to meet species protection goals and the needs of other water users. The Platte River Recovery Implementation Program brings together participants on an ongoing basis to help set goals, choose management options, and generate information about the effectiveness of their actions.32 Scientists engaged in the process do not make policy decisions, but they engage directly with participants to help them frame scientific questions relevant to management choices, understand available information, design monitoring systems to assess outcomes of management actions, and generate new knowledge tailored to addressing key decision-maker questions. The process has helped participants move beyond disagreements about the water-flow needs of the endangered species and move to action. Through monitoring, participants will evaluate whether the water flows and other management practices are achieving the goals for species recovery set out in the Platte River Recovery Implementation Plan. The term “adaptive management” is used here to refer to a specific approach in which decisions are adjusted over time to reflect new scientific information and decision-makers learn from experience. The National Research Council (NRC) contrasts the processes of “adaptive management” and “deliberation with analysis.”2 Both can be used as part of an “iterative adaptive risk management framework” that is useful for decisions about adaptation and ways to reduce future climate change, especially given uncertainties and ongoing advances in scientific understanding.4,5 Iterative adaptive risk management emphasizes learning by doing and continued adaptation to improve outcomes. It is especially useful when the likelihood of potential outcomes is very uncertain. An idealized iterative adaptive risk management process includes clearly defining the issue, establishing decision criteria, identifying and incorporating relevant information, evaluating options, and monitoring and revisiting effectiveness (Figure 26.3). The process can be used in situations of varying complexity, and while it can be more difficult for complex decisions,41 the incorporation of an iterative approach makes it possible to adjust decisions as information improves. Iterative adaptive risk management can be undertaken through collaborative processes that facilitate incorporation of stakeholder values in goal-setting and review of decision options.42 Examples of the process and decision support tools that are helpful at its different stages are included in subsequent sections of this chapter. understanding legal or institutional constraints on options. Identifying and agreeing on decision criteria – metrics that help participants judge the outcomes of different decision options – can be extremely helpful in clarifying the basis for reaching a decision. Based on the relevant objectives, decision criteria can be established that reflect constraints and values of decision-makers and affected parties. Criteria can be quantitative (for example, obtaining a particular rate of return on investment) or qualitative (for example, maintaining a community’s character or culture). If the issue identified is to reduce the risks associated with climate change, decision criteria might include minimizing long-term costs and maximizing public safety. Related sections below provide information on tools for valuing and comparing options and outcomes and provide a basis for using decision criteria. Developing a solid base of information to support decision-making is ideally a process of matching user needs with available information, including observations, models, and decision support tools. In some cases, needed information does not exist in the form useful to decision makers, thus requiring the capacity for synthesis of currently available information into new data products and formats. For decisions in the context of climate change and variability, it is critical to consult information that helps clarify the risks and opportunities to allow for appropriate planning and management. An example of information systems that synthesize data and products to support mitigation and adaptation decisions is the National Integrated Drought Information System (NIDIS), a federal, interagency effort to supply information about drought impacts and risks as well as decision support tools to allow sectors and communities to prepare for the effects of drought.48,49,50 Learning from the successes of such efforts, the National Climate Assessment (NCA) is currently developing an indicator system to track climate changes as well as physical, natural, and societal impacts, vulnerabilities, and responses.51 This effort is building on existing indicator efforts, such as the U.S. Environmental Protection Agency’s (EPA) Climate Change Indicators,52,53 NASA Vital Signs,54 and NOAA indicator products,55 as well as identifying when new data, information, and indicator products are needed. Information technology systems and data analytics can harness vast data sources, facilitating collection, storage, access, analysis, visualization, and collaboration by scientists, analysts, and decision-makers. Such technologies allow for rapid scenario building and testing using many different variables, enhancing capacity to measure the physical impacts of climate change. These technologies are managing an increasing volume of data from satellite instruments, in situ (direct) measurement networks, and increasingly detailed and high-resolution models.56 “Information Technology Supports Adaptation Decision-Making” below highlights use of an open platform data system that facilitated collaboration across multiple public and private sector entities in analyzing climate risk and adaptation economics along the U.S. Gulf Coast. Making effective climate-related decisions requires balance among actions intended to manage, reduce, and transfer risk. Risks are threats to life, health and safety, the environment, economic well-being, and other things of value. Risks are often evaluated in terms of how likely they are to occur (probability) and the damages that would result if they did happen (consequences). As noted by the Intergovernmental Panel on Climate Change,63 human choices affect the risks associated with climate variability and change. Such choices include how to manage our ecosystems and agriculture, where to live, and how to build resilient infrastructure. Choices regarding a portfolio of actions to address the risks associated with climate variability and change are most effective when they take into consideration the range of factors affecting human behavior, including people's perception of risk, the relative importance of those risks, and the socioeconomic context.63,64 The process shown in Figure 26.4 is designed to help take such factors into consideration. Risk assessment includes studies that estimate the likelihood of specific sets of events occurring and/or their potential consequences.68 Experts often provide quantitative information regarding the nature of the climate change risk and the degree of uncertainty surrounding their estimates. Risk assessment focuses on the likelihood of negative consequences but does not exclude the possibility that there may also be beneficial consequences. There are four basic elements for assessing risk – hazard, inventory, vulnerability, and loss.69 This generalized approach to risk assessment is useful for a variety of types of decisions. The first element focuses on the risk of a hazard as a function of climate change, including interactions of climate effects with other factors. In the context of the coastal community example, the community is concerned with the likelihood of future hurricanes and the impacts that sea level rise may have on damage to the residential development from future hurricanes. There is likely to be considerable uncertainty about maximum storm surge and sea level from hurricanes during the next 50 to 70 years. The second element identifies the inventory of properties, people, and the environment at risk. To inventory structures, for instance, requires evaluating their location, physical dimensions, and construction quality. Together, the hazard and inventory elements enable calculation of the damage vulnerability of the structures, people, and environment at risk. The vulnerability component enables estimation of the human, property, and environmental losses from different climate change scenarios by integrating biophysical information on climate change and other stressors with socioeconomic and environmental information.73 These assessments typically involve evaluation of exposure, sensitivity, and adaptive capacity for current and projected conditions. Quantitative indicators are increasingly used to diagnose potential vulnerabilities under different scenarios of socioeconomic and environmental change74,75 and to identify priorities and readiness for adaptation investments.76 In the case of a coastal residential development, the design of the facility will influence its ability to reduce damage from hurricanes and injuries or fatalities from hurricane storm surge and sea level rise. Decisions may involve determining whether to elevate the facility so it is above ten feet, how much this adaptation measure will cost, and the reduction in the impact of future hurricanes on damage to the facility and on the residents in the building, as a function of different climate change scenarios. The concept of risk perception refers to individual, group, and public views and attitudes toward risks, where risks are understood as threats to life, health and safety, the environment, economic well-being, and other things of value. Risk perception encompasses perspectives on various dimensions of risks, including their severity, scope, incidence, timing, controllability, and origins or causes. The knowledge base regarding risk perception includes research in psychology, social psychology, sociology, decision science, and health-related disciplines (see “Factors Affecting Attitudes Toward Risk”). The effects of risk perception on decision-making have also been studied extensively and support a number of conclusions that need to be considered in decision support processes. The decision process of non-experts with respect to low-probability, high-consequence events differs from that of experts.106 Non-experts tend to focus on short time horizons, seeking to recoup investments over a short period of time, in which case future impacts from climate change are not given much weight in actions taken today. This is a principal reason why there is a lack of interest in undertaking adaptation measures with upfront investments costs where the benefits accrue over a long period of time.107 In the context of the coastal residential development, elevating the structure will reduce expected damages from hurricanes, resulting in smaller annual insurance premiums. Long-term loans that spread the costs of this action over time can make the option financially attractive, if the savings on the insurance premiums outweigh the costs of the loan payments. There is also a tendency for decision-makers to treat a low-probability event as if it had no chance of occurring because it is below their threshold level of concern (such as a 1 in 100 chance of a damaging disaster occurring next year). As shown by empirical research, stretching the time horizon over which information is communicated can make a difference in risk perception.108 In the case of the coastal residential development, community leaders may pay more attention to the need for adaptation measures if the likelihood of inundation by a future hurricane is presented over a 25-year or 50-year horizon (for example, the facility may flood 5 times in 25 years) rather than as a risk on annual basis (for example, there is a 20% chance of flooding in any given year). In general, an effective response to the current and future risks from climate variability and change will require a portfolio of different types of actions, ranging from those intended to manage, reduce, and transfer risk to those intended to provide additional information on risks and the effectiveness of various actions for addressing it (see “Value of Information”). For instance, in the coastal community example, decision-makers might better manage risk through changes in building codes intended to reduce the impact of flooding on structures, might share risk by appropriate adjustments in flood insurance rates, and might reduce risk via land-use policies that shift development towards higher ground and via participating in and advocating for greenhouse gas emission reduction policies that may reduce future levels of sea level rise. 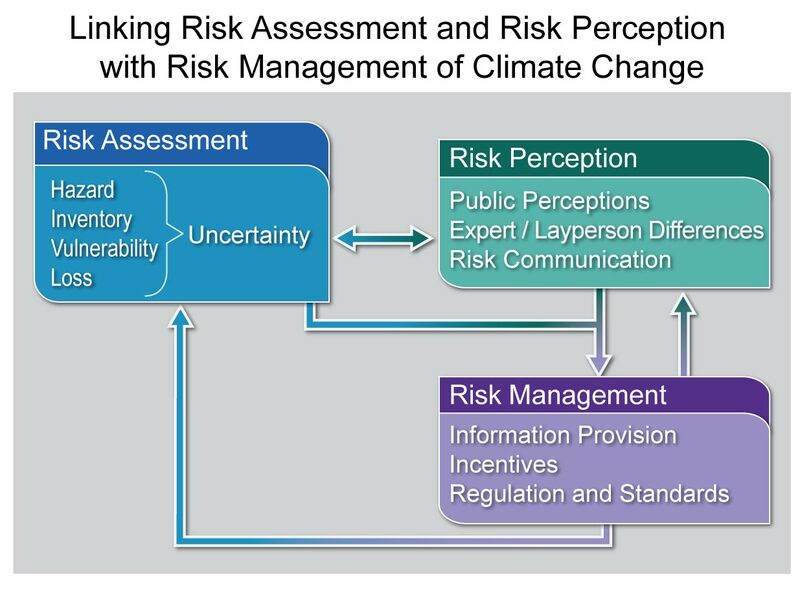 Turning to risk management strategies, public agencies, private firms, and individuals have incentives, information, and options available to adapt to emerging conditions due to climate change. These options may include ensuring continuity of service or fulfillment of agency responsibilities, addressing procurement or supply chain issues, preserving market share, or holding the line on agency or private-sector production costs. Commercially available mechanisms such as insurance can also play a role in providing protection against losses due to climate change.110 However, insurers may be unwilling to provide coverage against such losses due to the uncertainty of the risks and lack of clarity on the liability issues associated with global climate change.111 In these cases, public sector involvement through public education programs, economic incentives (subsidies and fines), and regulations and standards may be relevant options. Criteria for evaluating risk management strategies can include impacts on resource allocation, equity and distributional impacts, ease of implementation, and justification. The implementation phase of a well-structured decision process involves an ongoing cycle of setting goals, taking action, learning from experience, and monitoring to evaluate the consequences of undertaking specific actions, as shown on the left-hand side of Figure 26.3. This cycle offers the potential for policy and outcome improvement through time. Ongoing evaluation can focus on how the system responds to the decision, leading to better future decisions, as well as on how different stakeholders respond, resulting in improvements in future decision-making processes. The need for social and technical learning to inform decision-making is likely to increase in the face of pressures on social and resource systems from climate change. However, the relative effectiveness of monitoring and assessment in producing social and technical learning depends on the nature of the problem, the amount and kind of uncertainty and risk associated with climate change, and the design of the monitoring and evaluation efforts. Many decision support tools apply climate science and other information to specific decisions and issues; several online clearinghouses describe these tools and provide case studies of their use (for example, CAKE 2012;9 CCSP 2005;8 NatureServe 201210). Typically, these applications integrate observed or modeled data on climate and a resource or system to enable users to evaluate the potential consequences of options for management, investment, and other decisions. These tools apply to many types of decisions; examples of decisions and references for further information are provided in Table 26.2. Many available and widely applied decision-making tools can be used to support management in response to climate extremes or seasonal fluctuations. Development of decision support resources focused on decadal or multi-decadal investment decisions is in a relatively early stage but is evolving rapidly and shared through the types of clearinghouses discussed above. Understanding costs and benefits of different decisions requires understanding people’s preferences and developing ways to measure outcomes of those decisions relative to preferences. This “valuation” process is used to help rank alternative actions, illuminate tradeoffs, and enlighten public discourse.46 In the context of climate change, the process of measuring the economic values or non-monetary benefits of different outcomes involves managers, scientists, and stakeholders and a set of methods to help decision-makers evaluate the consequences of climate change decisions.126,127,128,129,130 Although values are defined differently by different individuals and groups and can involve different metrics – for example, monetary values and non-monetary benefit measures131,132,133 – in all cases, valuation is used to assess the relative importance to the public or specific stakeholders of different impacts. Such valuation assessments can be used as inputs into iterative adaptive risk management assessments (which has advantages in a climate context because of its ability to address uncertainty) or more traditional cost-benefit analyses, if appropriate. Once their consequences are valued or otherwise described, alternative options are often compared against the objectives or decision criteria. In such cases, approaches such as listing the pros and cons,149 cost-benefit analysis,150 multi-criteria methods,112 or robust decision methods151,152 can be useful. Multi-criteria methods provide a way to compare options by considering the positive and negative consequences for each of the objectives without having to choose a single valuation method for all the attributes important to decision-makers.46 This approach allows for consequences to be evaluated using criteria most relevant for a given objective.153 The options can then be compared directly by considering the relative importance of each objective for the particular decision. Scenarios are depictions of possible futures or plausible conditions given a set of assumptions; they are not predictions. Scenarios enable decision makers to consider uncertainties in future conditions and explore how alternate decisions could shape the futures or perform under uncertainty. One approach to building scenarios begins with identifying any changes over time that might occur in climate and socioeconomic factors (for example, population growth and changes in water availability), and then using these projections to help decision-makers rank the desirability of alternative decision options to respond to these changes.160 This works well when decision-makers agree on the definition of the problem and scientific evidence.71,161 A second approach is widely used in robust decision-making and decision-scaling approaches. It begins with a specific decision under consideration by a specific community of users and then poses questions relevant to these decisions (for example, “how can we build a vibrant economy in our community in light of uncertainty about population growth and water supply?”) to organize information about future climate and socioeconomic conditions (for example, Robinson 1988162). 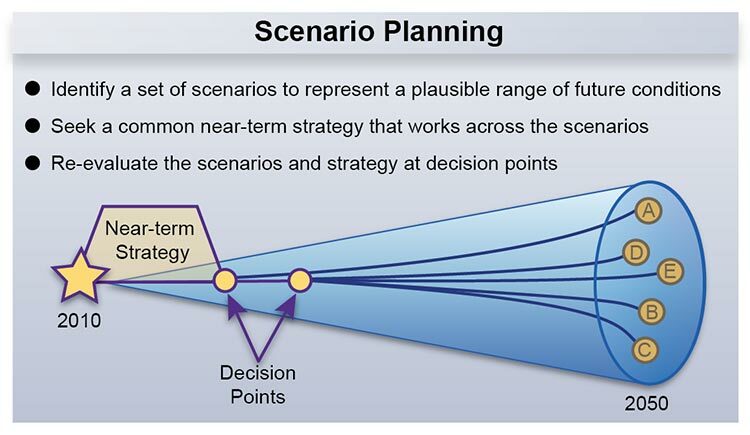 Scenario planning often combines quantitative science-based scenarios with participatory “visioning” processes used by communities and organizations to explore desired futures.163 It can also facilitate participatory learning and development of a common understanding of problems or decisions. There are many different approaches, from a single workshop that uses primarily qualitative approaches to more complex exercises that integrate qualitative and quantitative methods with visualization and/or simulation techniques over multiple workshops or meetings. Common elements include scoping and problem definition; group development of qualitative (and, optionally, quantitative) scenarios and analyses that explore interactions of key driving forces, uncertainties, and decision options. Denver Water is using scenario planning in its long-range planning process (looking out to 2050) to consider a range of plausible future scenarios (Figure 26.6). This approach contrasts with its traditional approach of planning for a single future based on demand projections and should better prepare the utility and enhance its ability to adapt to changing and uncertain future conditions. Denver Water is assessing multiple scenarios based on several potential water system challenges, including climate change, demographic and water-use changes, and economic and regulatory changes. The scenario planning strategy includes “robust decision-making,” which focuses on keeping as many future options open as possible while trying to ensure reliability of current supplies. Scenario planning was chosen as a way to plan for multiple possible futures, given the degree of uncertainty associated with many variables, particularly demographic change and potential changes in precipitation. This method is easy to understand and has gained acceptance across the utility. It is a good complement to more technical, detailed analytical approaches. The next step for Denver Water is to explore a more technical approach to test their existing plan and identified options against multiple climate change scenarios. Following a modified robust decision-making approach,170,171 Denver Water will test and hedge its plan and options until those options demonstrate that they can sufficiently handle a range of projected climate conditions. Ongoing assessments of the state of knowledge allow for iterative improvements in understanding over time and can provide opportunities to work directly with decision-makers to understand their needs for information.172 A sustained assessment process (Ch. 30: Sustained Assessment)57 can be designed to support the adaptation and mitigation information needs of decision-makers, with ongoing improvements in data quality and utility over time. This report represents one such type of assessment. The Intergovernmental Panel on Climate Change (IPCC) has prepared assessments of the state of the science related to climate change, impacts and adaptation, and mitigation since the late 1980s. Numerous additional assessments have been prepared for a variety of national and international bodies focused on issues such as biodiversity, ecosystem services, global change impacts in the Arctic, and many others. Between 2000 and 2007, pioneering work by the University of Washington’s Climate Impacts Group (a NOAA RISA) tailored national climate models to the Pacific Northwest and produced, for the first time, specific information about likely adverse impacts to virtually every part of Washington’s economy and environment if carbon dioxide concentrations in the atmosphere were not quickly stabilized.173 The localized impacts predicted from these models were significant. In February of 2007, Governor Christine Gregoire issued Executive Order 07-02, establishing the Climate Action Team (CAT).174 Its charge was to develop a plan to achieve dramatic, climate-stabilizing reductions in emissions of greenhouse gases according to goals established in the Executive Order. The CAT was a 29-member team that included representatives of industry, utilities, environmental advocacy groups, Native American tribes, state and municipal governments, and elected officials. The CAT met four to five times a year for two years. Between meetings, technical consultants, including boundary organizations such as the Climate Impacts Group, provided detailed analyses of the issues that were on the next CAT agenda. Technical experts were recruited to provide direct testimony to the CAT. Professional facilitators helped run the meetings, decipher the technical testimony, and keep the CAT on track to meet its obligations. All CAT meetings were open to the public, and public testimony was accepted. To assist in this effort, five subcommittees were created to develop proposals for achieving emissions reductions in the following parts of the economy: the built environment, agriculture, forestry, transportation, and energy generation. Similarly, adaptation groups were formed to develop recommendations for dealing with impacts that could not be avoided. These Preparation/Adaptation Working Groups focused on forest health, farmlands, human health, and coastal infrastructure and resources. In 2008, the CAT continued its work. The focus shifted to whether Washington should join the Western Climate Initiative (WCI), a state and provincial organization that was developing a regional, economy-wide cap and trade system for carbon emissions. The same high-quality professional facilitation was provided at all meetings. Several highly qualified technical experts provided technical support. With this support, the CAT produced another set of recommendations.177 The centerpiece recommendation was that Washington join the WCI’s regional cap and trade program. This time, the combination of a weakening economy and political dynamics trumped the CAT’s findings, and resulted in a decision not to implement its recommendations. A comprehensive analysis of the state of decision support for adaptation and mitigation, including assessment of processes, tools, and applications, and development of a knowledge-sharing platform will facilitate wide public access to these resources. Comparisons of different adaptation and mitigation options will be improved by investments in understanding how the effects of climate change and response options can be valued and compared, especially for non-market ecosystem goods and services146,185,186,187,188 and those impacts and decisions that have an effect over long time scales. Improvements in risk management require closing the gap between expert and public understanding of risk and building the institutions and processes needed for managing persistent risks over the long term. Probabilistic forecasts or other information regarding consequential climate extremes/events have the potential to be very useful for decision-makers, if used with improving information on the consequences of climate change and appropriate decision support tools. Better methods for assessing and communicating scientific confidence and uncertainty in the context of specific decisions would be very useful in supporting risk management strategies. 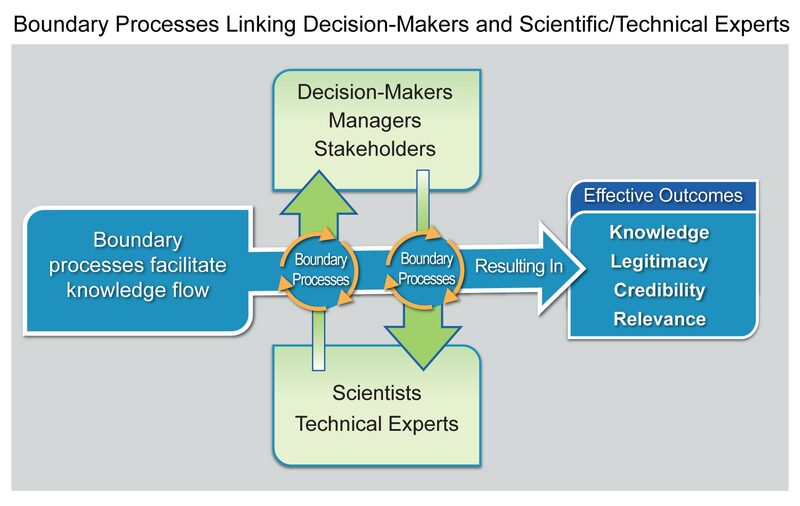 Improvements in processes that effectively link scientists with decision-makers and the public in resource management settings and developing criteria to evaluate their effectiveness would enhance knowledge building and understanding.